Illinois is always home to talented prospect both early and late in the recruiting process and whether you’re looking for guards, wings, or interior prospects you can always expect the land of Lincoln to be front and center in any of those conversations. The 2019 class is no exception as a number of late blooming prospects are continuing to open eyes and Christian “C.J.” Wilbourn of Normal Community High School is no exception. A 6-9 225 pound forward who can also double as a center on occasion, Wilbourn has quietly developed into an impressive prospect physically. More of a face up type big at this point, Wilbourn has shown an ability to knock down the mid-range jumper, square up and rip the nets from beyond the arc, and he can finish on occasion attacking the rim with either hand through traffic. He moves well on both ends, he has nice length that he combines with strength and athleticism to make for an intriguing prospect defensively, and he brings a lot of intangibles to the court as well. Not afraid to mix it up on either end of the floor, one of the big things the talented standout from Illinois has is a natural leadership quality that gives him a powerful voice inside the huddle that his teammates respond to. 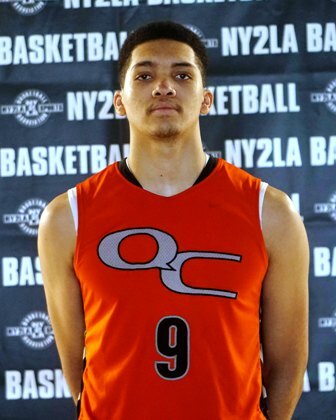 Off the court the Normal Community standout checks boxes in a high fashion as well as his character and grades are exemplary making him a prospect that can attend any school in the country in that regard. American and UW-Milwaukee have offered Wilbourn so far. Still far from a finished product in some ways, the emerging and late blooming big from Illinois has his best basketball in front of him and given the lack of interior depth in the 2019 class combined with the ceiling and potential of Wilbourn into the future, the Normal Community standout is one of the better kept secrets in the class and he’s easily a sleeper to check out. C.J. Wilbourn played with the Quad City Elite during the grassroots travel season.